Protect Yourself With Your Snubnose Revolver is the “all in one book” that teaches you what you need to know to use your snubnose revolver in self defense. The snubby has protected and saved lives for decades, and this book shows you how it’s done! I’ve taken my decades of experience carrying a snub and teaching people how to use it efficiently, and distilled what I know into this easy-to-read book full of tips, resources, and specific exercises to help you master the quintessential defensive handgun. This is the most comprehensive book on the defensive use of the snubnose revolver that’s been written. If you want one book to help you learn all about protecting yourself and your loved ones with a snubby, this is it! 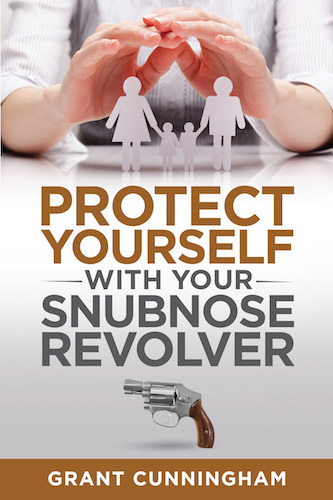 Protect Yourself With Your Snubnose Revolver is available in Kindle and paperback from Amazon, and for your iOS device at the Apple iBooks Store! Hey Buddy!, I found this information for you: "Protect Yourself With Your Snubnose Revolver book". Here is the website link: http://www.grantcunningham.com/information-store/protect-snubnose-revolver-book/. Thank you.